The Steelers continued to be active in the free agency market (in their own, shopping for bargains kind of way) with the signing of center Justin Hartwig. Before your curse the day that the Steelers signed him (a la Sean Mahan), it's a good idea to know a bit about the man behind the mediocre performance. Mr. Hartwig, originally from Mankato, Minnesota, is 29 years old, stands 6'4" tall, and weighs a 312 pounds.
. . . who appeared in 38 games with 34 starts." 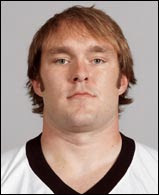 After appearing in just three games his rookie season -- and those on special teams -- Mr. Hartwig won the starting center job during the 2003 training camp (during which Mr. Hartwig and then-teammate Albert Haynesworth got into an altercation during which Mr. Haynesworth reportedly kicked Mr. Hartwig in the chest), and started 47 games at that position over three seasons in Tennessee. In March 2006 Mr. Hartwig signed a free agent contract (reportedly 5 years, $17 million) with Carolina. At the time Carolina head coach John Fox was quoted as saying "[w]e had him highly rated in our free-agency evaluation . . . [h]e's got the ability to play both center and guard. . . he's going to be a good addition for us." But during that first season in Carolina Mr. Hartwig played in only two games. After suffering a torn groin the first week of the 2006 season and then re-injuring the groin in the weight room, Mr. Hartwig was placed on injured reserve. "We had decided to go in another direction at center and Justin would have been able to come in and compete for the starting spot at right guard . . . [b]ut we decided probably the right thing to do for Justin was make this move now and see if he can get with a team that would consider him as a starter at center." A week later Mr. Hartwig is a member of the Pittsburgh Steelers -- the very franchise that Carolina's owner, Jerry Richardson, said he would like his team to emulate.